There are only a handful of occasions when a TV show or film has set the bar in terms of quality in the way Game of Thrones has done. The popular HBO series first premiered in April 2011 and, since its beginnings, has been causing waves globally and winning many awards and accolades. In terms of story, Game of Thrones offers a combination of political intrigue, treachery, and all the wonders that we’ve come to expect from a fantasy show. At risk of greatly simplifying the plot, we can say that it’s like watching Lord of the Rings combined with a crime and murder series. Despite the terrible circumstances that its characters constantly face, and all the gratuitous death, the way in which the series is presented is brilliant. And now that the eighth and final season is just around the corner, we can’t wait to see how the situation in Westeros will unfold. Season 8 of Game of Thrones is scheduled for premiering this April 14, 2019. After almost 2 years since the previous season ended with a bang, we will finally be able to witness the climactic ending of our beloved series. However, for us who’ve been waiting for so long, these last few days will be like torture. Luckily, for those fans who are suffering while waiting for the fateful premiere, we present to you Game of Thrones Conquest. 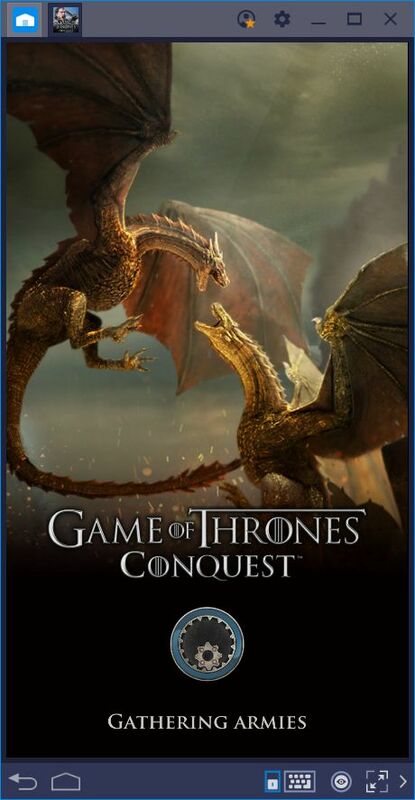 As its name implies, Game of Thrones conquest is a strategy conquest game set in the continent of Westeros. This title offers everything we’ve come to expect from a game in this genre such as real-time construction, resource gathering, army building, and more war than you ever could’ve imagined. All of these features go hand in hand with your favorite characters from the eponymous series, including the cunning Tyrion Lannister, The courageous Jon Snow, and the powerful Daenerys. 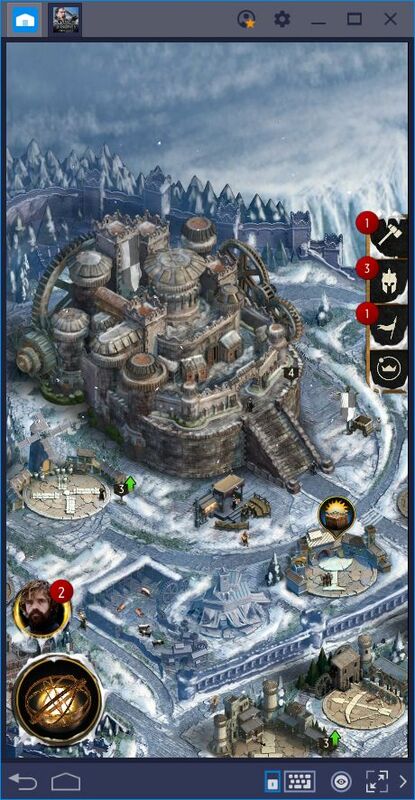 In GOT Conquest, you will join hands with your favorite characters to create a fortress worthy of a powerful leader. However, you will have to overcome many trials such as establishing an effective production line, as well as shoring up your defenses to protect your resources from enemy raiders. In this sense, the game is similar to Final Fantasy XV: A New Empire , in the way in which both are conquest titles licensed from other media. The first difference that we noticed between GOT Conquest and other similar games is, undoubtedly, its art style. 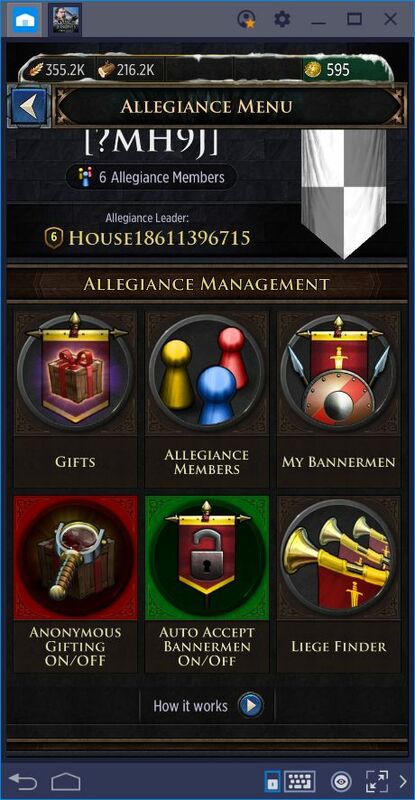 In this genre, we’re used to seeing a certain layout in the game’s interface. This game is played in portrait mode, just like World War Rising , which considerably limits its space screen. However, your fortress is designed in a manner that allows you to view most of its structures with only minimal panning required. Furthermore, the design of the UI is sleek, responsive, and very smooth; something that is difficult to find in these games. In other words, GOT Conquest is a game that is both fun to play, as well as pleasing to the eye. It’s aesthetics live up to the show in which it’s based. On many occasions, licensed games usually leave much to be desired in terms of quality. However, GOT Conquest promises hours of fun alongside your favorite characters in the series. 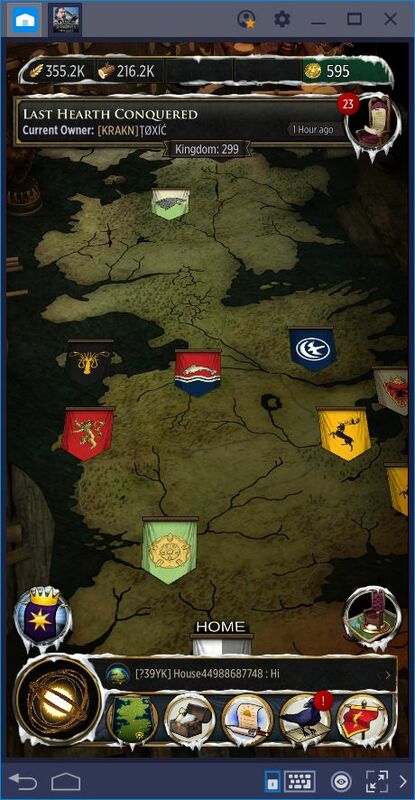 As we mentioned above, this game is set in Westeros. It is your duty to take command of the fortress granted to you by Daenerys and restore it to its former glory. Even though the game is set in the same location as the show, its events are completely isolated from the series’ narrative. 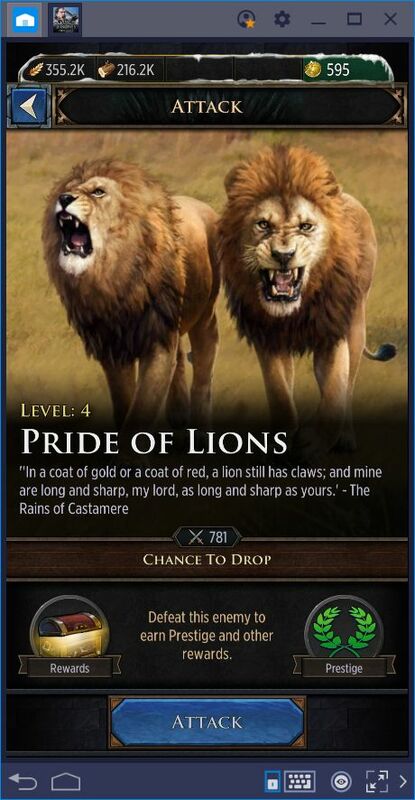 Because of this, you have free reign to develop your fortress as you wish and, if you have enough strength, you can even attack all those who dare approach your base. Conversely, you could also establish relationships with other players and work towards a common goal. However, not everything is as simple in this game. To ensure the proper growth of your fortress, you must perform many tasks. 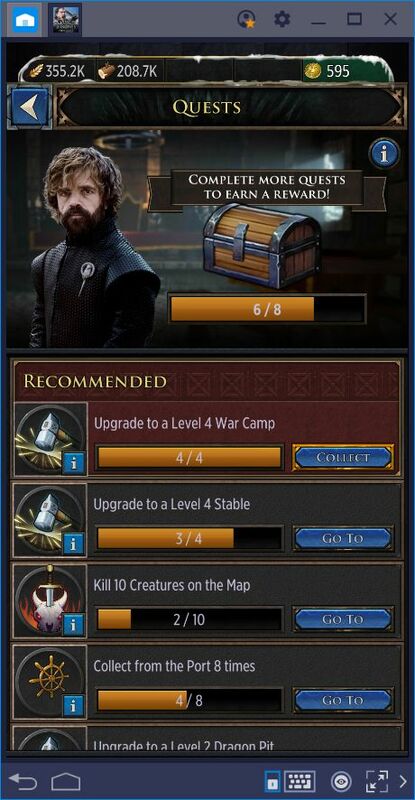 For this reason, the vast majority of your time in this game will be spent building and upgrading structures, as well as training new troops in your stables and barracks. To speed up your progress and gather important supplies for developing your base, you can also undertake hunting trips across the map to fell dangerous creatures. The resources received through these hunts are automatically added to your inventory upon completion and are immediately ready for use. Aside from improving your fortress, you can also procure gear to outfit your hero. Your hero is your avatar in this game, the commander of the fortress, and the one charged with overseeing its restoration. As you progress through the game, you will pick up new gear and items that are used for upgrading your hero. Furthermore, most actions that you perform generate XP which help to increase your hero’s level. 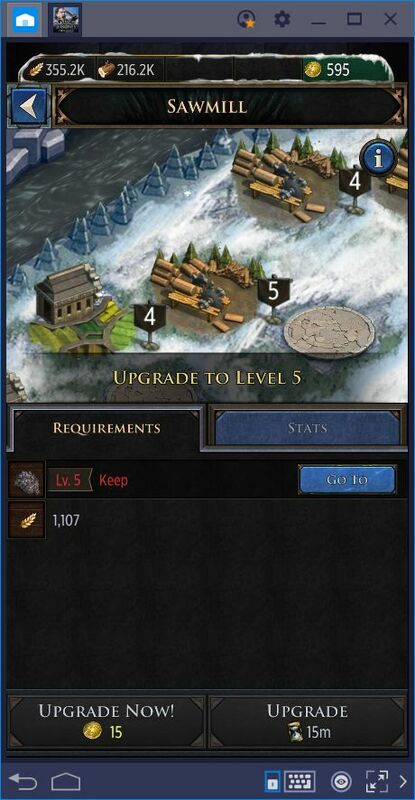 By increasing your XP level, you will receive resources, limited items, and other important goodies. 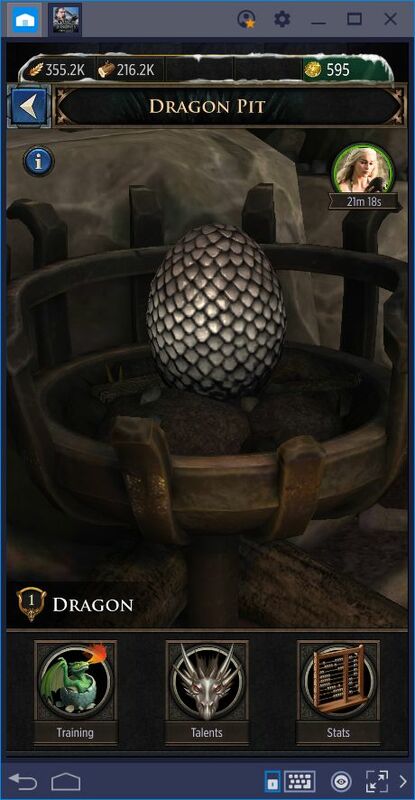 Lastly, once you advance a bit into the game, you will discover some Valyrian ruins which house an old dragon egg. This creature, once hatched, will become your greatest ally in the field, and will accompany you wherever you go. With proper care, your dragon will increase its level and learn new skills that can bestow passive bonuses to your fortress. This mechanic is similar to the airship in Guns of Glory , or to the dragon that is also featured in King of Avalon. If you’ve played these titles before, the dragon mechanic in GOT Conquest will be very familiar to you. Game of Thrones Conquest is a brilliant adaptation of the TV series. The game captures the elements that took the elevated to the peaks of popularity, especially when it comes to the aspects of treachery and intrigue. If you’re a fan of the show, we recommend taking a look at this game. Even if you’re not keen on conquest games, you will find loads of fun while you wait for the premiere of season eight.